A frequently encountered childhood problem, ear infections refer to conditions that affect the middle ear, meaning the section behind the eardrum where the tiny vibrating bones of the ear are located. Because we are aware that these conditions are painful, our experienced and caring staff will act quickly and try to lighten the level of discomfort. Ear infections are generally caused by bacteria or viruses in the middle ear, microorganisms that generate inflammation and buildups of fluids. It is important to note that the infections can frequently develop in the wake of other illnesses, such as a cold, flu or an allergic episode. Ear infections are also known to appear following an inflammation of the Eustachian tubes, which are narrower in children and hence, clog easier. In the event when the symptoms last more than one day, the child accuses severe pain and there is discharge or fluid, pus or blood from the ear, it is highly advisable to seek emergency medical help right away. 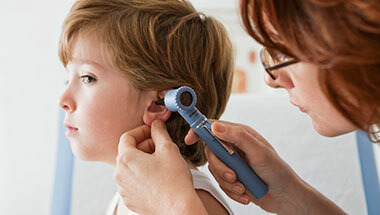 To establish whether the child is experiencing an ear infection, the physician will employ a pneumatic otoscope, which is a lighting instrument that allows the otolaryngologist to examine the middle ear. In addition to helping the physician discover the fluid buildup, the tool is utilized to examine the eardrum. If the eardrum doesn’t move when puffed gently, it usually means it’s filled with liquid and that an infection is present. In case the condition doesn’t ameliorate following the treatment, then the physician will perform additional tests, such as tympanometry, and audiometric evaluation. What treatments are recommended for ear infections? Depending on the age of the child and severity of the condition, the physician may prescribe pain medicine and warm compresses to alleviate some of the discomfort. Initially, the doctor will clean the ear and wait to see if the symptoms disappear on their own. In the event when the child still has fever and the symptomatology doesn’t improve, the specialist will recommend antibiotics. Because ear infections in infants and severe cases bear severe consequences including partial loss of hearing, it is highly recommended to contact us in case your suspect your child developed this condition. After Dr. Samadi obtains a full history and examiantion, he will recommend the most suitable treatment and monitor your child closely to ensure recovery is enhanced for your child.